our company is an impressive and richly coloured bronze-toned schist possessing a nuance of golden shimmer. The schist is densely layered and finegrained, enhancing the stone’s cleavage. 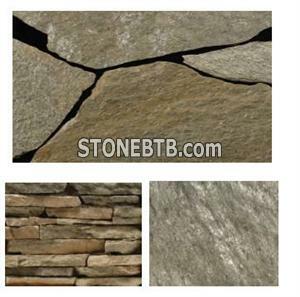 The stone’s minerals are firmly bound to each other, providing excellent resistance to weather and wear. Besides being a superb choice as a facing material for fireplaces, either as a naturally cleaved or sawn slab, Paljakka Cloudberry is also an imposing solution for the tiling of walls and floors, either sawn, as a naturally cleaved slab, or as a masonry stone.